Defeat N'Gasta and rescue Iszara from Clavicus Vile. Return to the Isle of N'Gasta and enter N'Gasta's Tower. Pick up the glass vial in the western room and fill it with elixir from the cauldron. Pour the elixir into the central pit and time a jump to the stairs leading up. Confront N'Gasta at the top and defeat him using the Flask of Lillandril. Drip the correct mixtures onto the symbol to create a portal to the realm of Clavicus Vile. Confront Vile and wager your soul for the soul of Iszara. Ask one of the guardians a question and choose the right door. You have the Flask of Lillandril and with it the key to defeating N'Gasta. Return to the Isle of N'Gasta and traverse its obstacles once more to reach N'Gasta's Tower. This time, however, the gate will open and N'Gasta's voice is heard eerily from the tower: "Come, Cyrus. This one has what you seek." Enter the tower and prepare for two tough vermai ready to rip you apart. You can face them with a sabre, although their attacks cannot be blocked and you will probably lose a lot of health. The best method is to run quickly around the central pit. In most cases, they will follow you directly and fall into the pit's deadly purple substance. If this doesn't work and you have to fight them, a good strategy is to run up the stairs on the left, forcing only one to follow. They die in five regular hits. Neither N'Gasta nor Iszara appear to be downstairs, so you need to ascend the spiral staircase. Unfortunately, a section of it is broken. To reach the lowest ledge of the upper stairs, you need to boost your jump with an explosion from the central pit. Search the western room for a glass vial and fill it with elixir from the cauldron in that room. Stand by the pit and save your game because this jump is difficult to time correctly. Pour the elixir into the pit; the camera moves upward to show the concoction bubbling. Wait about five seconds then take a running jump over the pit in the direction of the ledge. With luck, the resulting explosion will send you to the ledge where you end up hanging. If you survive but don't make the jump you can refill the elixir from the same cauldron. Before entering N'Gasta's chambers at the top, select the Flask of Lillandril as your current item so it's ready. As you walk in, the scene The Fate of Iszara begins. 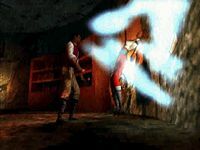 Cyrus finds Iszara standing by the wall but her soul is gone, making her seem unconscious. The necromancer comes through a magical gate and laughs. He explains how Iszara came to him hoping he would restore Prince A'tor from the soul gem. He offered to do so in return for her soul, which she accepted out of desperation. 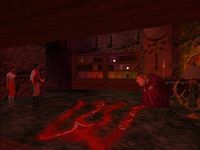 N'Gasta offered her soul to Clavicus Vile and fashioned the soul gem into the amulet that you delivered to Lord Richton. Cyrus threatens to kill N'Gasta if he doesn't revert his actions. Wait for him to say, "The question is: does your soul get caught in your own soulsnare after you die, or does it just get to go straight to hell? Let me help you find out. ", because the scene ends immediately and N'Gasta starts casting spells at you. Ready the Flask of Lillandril; this prevents you from moving. 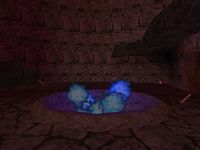 N'Gasta teleports around the room, casting a spell at each location, so choose a spot against a wall to reduce his ability to attack from behind. Aim the flask at incoming spells and they will be reflected back at him. After five successful hits, he dissolves into a blue puddle. Now that N'Gasta is dead, you can check on Iszara but she is still non-responsive. The only way to save her is to restore her soul by bargaining with the one who has it: Clavicus Vile. Look at N'Gasta's spellbook on the pedestal. 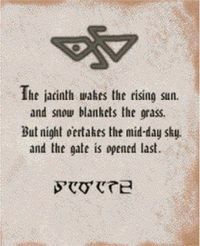 There is some Daedric text and a cryptic riddle that describes how to open a portal to Vile's realm. and snow blankets the grass. and the gate is opened last." The necromancer's lab is well stocked with potions and ingredients. Each bold word in the riddle has a color associated with it, and these colors can be matched up with the items. The first word in each line refers to an ingredient, and the second word to a potion. You may already have the potions from the alchemist's shack on Stros M'Kai, but you can find them on a shelf here too. Take the potions you need and sublimate them with the corresponding ingredient. If you sublimate the wrong potion, you can drink it or drip it on the symbol in the center of the room to try again. Avoid drinking potions with Daedra's heart, though, as they cause 50 damage. To open the portal, drip each mixture onto the symbol in order, starting with Orc's blood. If you mess up, Cyrus says, "Damn. I better try something else. "; otherwise, you'll see a spell effect. The portal opens and all you have to do to visit Clavicus Vile is walk into it. You are transported to a strange realm of green grass, tall round trees, and a flowing stream. Cross the bridge over to the house and talk to Vile, who is sitting on a tree stump next to his dog. Ask him about Daedra and then the topic "Why Are You Doing This?" You are given the option to offer the Flask of Lillandril, gold, blood, or nothing in return for Iszara's soul. Vile doesn't think much of any offering except the flask, which he takes as a present rather than payment. You can continue trying the other options, but now you can ask him what he really wants. You again have an option, either to trade or wager your own soul for Iszara's. Vile prefers the idea of a wager. You have a few more options in the dialogue—saying whether you are scared of what he may do, and whether to resist his attempt to make you apologize for your rudeness—but these decisions do not matter. "Two doors. One leads to the loss of your soul, the other leads to the return of Iszara's. "Two guardians. One always lies, one always tells the truth. "You can ask one of them just one question. Just one. The game begins...choose wisely... Hee hee!" This is a common logic puzzle. The solution is to ask one of the guardians, "Which Door Would the Other Say is Correct?" Both guardians answer with "The left door", meaning the right door is the correct one. Even if you know the answer ahead of time, you'll lose if you pick a door and did not ask this specific question. Losing means death in this game. The reason this question works is because it deals with the other's response. Both of them will tell you the wrong door because their truthful and lying natures cancel each other out. Therefore, the opposite of what is said must be correct. Vile sends you back to the tower and the scene Iszara Restored begins. In summary, Cyrus restores Iszara's soul to her body and together they travel to the League hideout. They have a short conversation on the way there. Basil is frustrated that Iszara lost the soul, and everyone soon loses hope when Cyrus reveals that he was tricked into delivering it to Richton. Cyrus promises to get it back from the treasure vaults and kill the dragon guarding it. 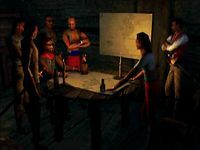 Iszara gives him a gold key to open the vaults, and she rides back to Saintsport with him to have a private conversation about their past and future. 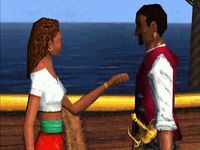 The cutscene ends with you on the docks, the same as the last time you returned from the hideout. It is daytime once again. 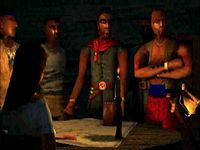 The riddle Vile asks is a variation of the Knights and Knaves logic puzzle, specifically the "fork in the road" variant. 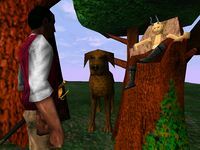 There is a variable called after_iszara that enables and disables many dialogue topics throughout the game, but completing this quest does not change its value, and therefore these changes are never implemented. Most of the dialogue that is disabled only makes sense if Iszara were still missing. The dialogue that should be enabled is related to her being found and N'Gasta being dead. ? If this bug were fixed, it would have the consequence of introducing dialogue for Nidal that can cause a game-breaking bug preventing the start of the quest Raze the Palace. This is the dialogue that occurs when you reach the top of the tower. Cyrus: "Iszara? What's wrong? Iszara?! What's happened to you? Snap out of it! Iszara!" Cyrus: "What have you done to her, N'Gasta?!" 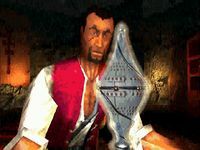 N'Gasta: "Iszara is just another entry in the ledger of lost souls, Master Cyrus! She belongs to the great Lord Vile now!" Cyrus: "What have you done to her?!?" N'Gasta: "She pledged her soul to this one, in return for services, and, since she had no immediate use, this one gifted her to Lord Vile." Cyrus: "What pledge? What service?" N'Gasta: "Iszara came thither three months ago, pleading this one to help her free Prince A'tor from the soulgem. The dim child had even brought the soulgem with her. "This one told her the deed might be accomplished, but, knowing the eagerness of a client, this one was quite candid about the high price of such services. "In return for her soul, this one agreed to free her beloved Prince A'tor. Perhaps you will count my fee too dear, but cannot the client best judge the true value of a service?" Cyrus: "Worm. If you will restore her to me now, I give you my word... I will not allow myself to bring you harm." N'Gasta: "That is quite impossible, of course. "Her soul is long since delivered to Clavicus Vile, patron Daedra Lord, within whose distant realm your sister's soul now resides. 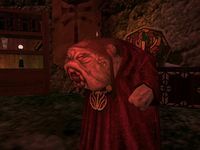 "The very soulgem that adorns the amulet that you delivered to Lord Richton. "Ah, well... this one has ages ahead to fulfill the bargain. "And it seems petty to deny Lord Richton the pleasure of wearing his defeated enemy's soul like a trinket? Don't you think?" Cyrus: "Worm, restore her now." Cyrus: "I will kill you, more quickly than you deserve, and just talk to Vile myself." N'Gasta: "Now, now. Let your sister serve as a walking, talking cautionary tale, Cyrus. Would you repeat her mistakes by trifling with this one? And, you propose to browbeat my Lord Vile into relinquishing your sister's soul? Surely consider this--"
Cyrus: "Vile is my business now. You have other things to worry about." "Really...? What might conceivably trouble this one?" Cyrus: "The question is: does your soul get caught in your own soulsnare after you die, or does it just get to go straight to hell? Let me help you find out." "Caught up already, have you?" "Do you plan to stay this time?" "You speak grandly of spending blood that is not your own, Cyrus." 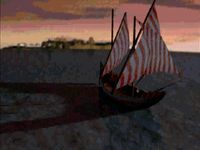 This scene is divided into four parts, which you can skip by pressing ESC (default). The cutscene begins outside N'Gasta Tower, as the view moves to a window at the top. A portal opens and Cyrus emerges from Clavicus Vile's realm with Iszara's soul, contained within an elegant flask. He brings it over to Iszara and the flask dissolves into a magical energy that surrounds her. She soon wakes from her mindless state. Cyrus: "You are safe, Iszara." Iszara: "Where is N'gasta? Is he dead? Where is the soulgem?" Iszara: "I,I [sic] have to get back to the League." Iszara heads toward the stairs. Iszara: "What have I done?" She runs down the stairs, then pauses to look back at Cyrus. Iszara: "Are you coming or not?" 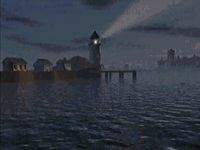 The scene cuts to the Saintsport lighthouse, shining in the night. Yaeli arrives in her boat and they head off in the early morning. Yaeli: "Caught up already, have you?" Cyrus walks over to Iszara. Iszara: "Do you plan to stay this time?" Iszara: "Because you could run again." Iszara: "It wasn't your war then." Iszara: "And it's not your war now." Iszara: "And if you expect anything more than that right now you can go to hell." The scene cuts again to the League hideout, in a dark room filled with League members. Basil: "That's just great, Iszara." Iszara: "Don't give me that. Even if we still had the soulgem we'd be in the same place. "You'd still be hiding in this cave and Richton still be in our Prince's palace." Basil: "There's a difference between hiding from the Empire and Biding, Our, Time." Basil: "You lost the soulgem! What now, girl?" Cyrus: "I know where it is." Cyrus: "Richton has the soulgem." Basil: "You've seen him with it?" Cyrus: "I gave it to him." Everyone looks at Cyrus, disappointed. Cyrus: "I didn't know what it was the Necromancer had it fashioned into an amulet, a gift for the Governor. "He needed someone to deliver it. I did, thinking I could somehow get to you." Basil: "My heart just broke. Yours, too?" Cyrus: "We'll just have to get it back." Basil: "We'll be killed as soon as we step onto the shore." Cyrus: "What's the point of being condemned as rebels in arms if we never take up those arms against the Empire?" Cyrus: "I tell you, Basil, and hear me well. Whether you like it or not, I'm in this now, until the end." Basil: "I'm not sending my men to Stros M'kai, soulgem lost or no. Hammerfell needs us alive." Cyrus: "What good are you, Basil, if you do nothing? Are you afraid of shedding a little blood?" Basil: "You speak grandly of spending blood that is not your own, Cyrus. As for the League, we do what we can, even in hiding. "We're pirates, man, the purest form of sedition- to thieve, snare, slit the throat unbeheld- the ever-resident thorns, keeping all sides at guard, alleviating every inertia with our own. "in his gold purse. If he doesn't squeeze this province for the profits the Emperor demands, HIS head will roll." Cyrus: "Don't forget the dragon, Basil. Because THAT'S the thing you really fear, isn't it? "The Battle of Stros M'Kai hung in the balance until the Governor called in his dragon, right?" Basil: "Well, there's that, too." Cyrus: "I'll take care of the dragon." Vander: "Can I feel your muscle?" Iszara: "Richton probably has the dragon guarding the soulgem in the Palace treasure vaults." 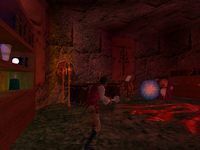 Iszara: "You can enter them through the catacombs, but you need the key." Iszara hands Cyrus a gold key. Cyrus: "Where'd you get this?" Basil: "The Prince and your sister were good friends, Cyrus. The treasure vaults were to be her jewelry chambers." Cyrus: "I've had enough of your chatter, Basil! I'm going to find the gem and then I'll find somebody who'll bring the Prince back! "When that's done, should I tell him to expect your aid or not?" Basil: "I EXPECT you'll have just as much success as your sister had, Cyrus. "You can hardly do any worse." Iszara: "I'll go with you." Cyrus: "You're too weak, still. Look, I've done well enough to this point. I can finish this. For you." "When I have the soulgem and somebody that can break its magic, what should I do?" Iszara: "Send us the signal and we'll meet at the Temple. Brother Nidal has A'tor's body hidden there." 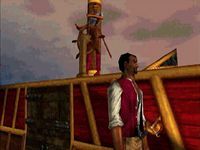 Basil: "Redguard. When you have the Prince, you have his men." 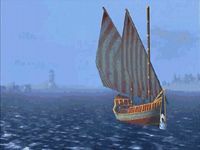 The scene fades to Yaeli's boat again, going back to Stros M'Kai. Iszara: "I should help you." Cyrus: "You're too well known on the island. The Imperials"
Iszara: "I could handle them"
"I won't fail you. Not like last time." Iszara: "Look. Let's get this straight. You murdered my husband, and ran away. "On one day you robbed me of the two people I loved and trusted most in all the world. "Hakan was not much of a husband, but you were not, and are not, fit to judge him. "Nor am I fit to judge you. You're guilty of gods-know how many crimes and cruelties, not the least of all what you've done to your own flesh and blood. "But... whatever harm you've done to me, I forgive you. You are my blood, and younger brother, and I can do no less. "But if you trifle with the affairs of the League, and with the fate of Hammerfell and her people, then run away like you did last time, I will find you. "but if you take up this thing, you will see it through to the end... or I will kill you." Cyrus: "I am GOING to find that soulgem. And I WILL get your Prince back. "is happening here, and I...I don't really know what I'm saying, but...."
Iszara: "Then don't say anything. I'm not interested in your words, Cyrus. "It's enough to have you here. I just have to believe you'll stay when I need you." Cyrus: "I will finish this." This page was last modified on 22 August 2018, at 04:24.